service life. Original-specification reproduction firearms and accoutrements are allowed. appropriate for a specific rifle. • Shoot from any position: Standing, bench, prone, sitting, or kneeling. sighters on an extra target if you want to print one just for that. rounds or tracer ammo may be forbidden, due to dry conditions. • Required equipment: Eye and ear protection. 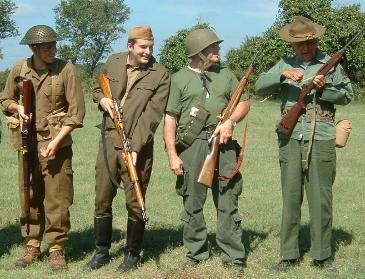 military-style sling and field jacket, bayonet. • Be sure to fill out all the blanks on the target forms. sure to submit together for each rifle both the appropriate "Rapid Fire" and "Slow Fire"
targets. Self-scoring is optional. Match director will score/re-score all targets as needed. ▪ USPS: 8910 Oakwood Court, San Antonio, 78240-3592 postmarked on or before that date. Questions? Call 210-385-0629 voice/text, or email philip30cal@gmail.com. and scoped, Allies and Triple-Entente/Axis, bench and prone, etc.